A simple, hearty and healthy soup. This soup is so yummy and the only way I can get vegetables into my 3 year old. 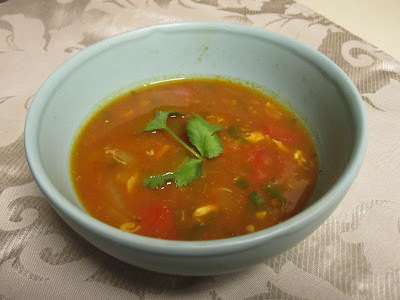 I created this soup for Christmas Eve one year and have been enjoying it ever since. In fact, even though its 100 degrees outside I think I'm going to make a bowl of soup. No amount of temperature can keep me from enjoying a good bowl of soup. In pot, heat olive oil. Saute onion, garlic, carrot and celery until soft. Add tomato. Saute additional 3-5 minutes. Add tomato sauce, broth, chicken and water. Cook until boiling. Serve with grated cheese, sour cream or tortilla chips. Bag, Bag, What's in the Handmade Bag? ?